Simon Fraser School Annex (1929) at 123 East 6th Avenue, designed by Henry Walter Postle, has architectural merit as an intact example of institutional Arts & Craft-style architecture, as expressed in a two-storey form with paired gabled dormers and its quintessential half-timbering detailing on stucco and wood frame. In February 2017, City Council approved a rezoning of parts of the Mount Pleasant Industrial Area to new I-1A and 1-1B (Industrial) zones, in order to support and enable the intensification of digital and technology uses by increasing maximum floor space area ratio (FAR) up to 5:0 FAR with contributions to community amenities (CACs), e.g. affordable housing and heritage. 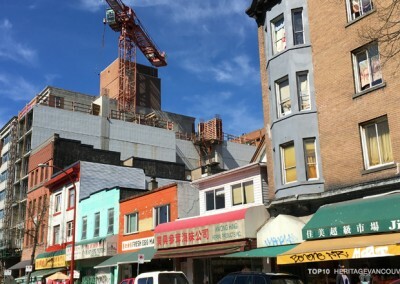 What this means for the area’s character is that larger-scale, taller, light industrial buildings can now be built along the blocks between Quebec Street and the lane west of Main Street, from East 2nd Avenue to the north, and East 6th Avenue to the south. 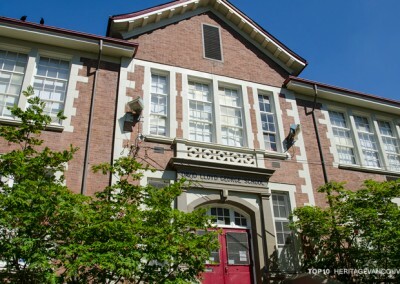 The ability to have larger, tall buildings in the area may have economic benefits, but creates a threat to the future of Simon Fraser Elementary School Annex (123 East 6th Avenue), owned by the City of Vancouver, because it is facing redevelopment pressures that could result in a huge building on the site that will force demolition of the heritage asset. 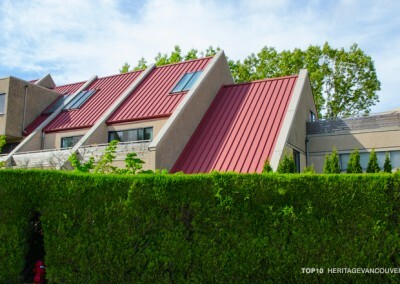 Vancouver Heritage Commission has assessed the heritage value of Simon Fraser Annex, and, in 2016, recommended to Council that this historic place be added to the Vancouver Heritage Register as a Category “B” heritage resource. We urge the City to register this property, and to work to retain this building rather than demolish it. With careful site planning the Annex could remain where it is, and be co-located with a new building of modestly less height (e.g. 110 feet) than the I-1A and 1-1B zones allow, through a design that fits the existing scale of the Annex. Loss of some job space, and upgrades to the school, could be offset with CACs from the development of other properties in the vicinity, and through CACs it may even be possible to use a portion of the school site as urban open space. What is the threat to Simon Fraser Elementary School Annex? Last year, the City engaged the Mount Pleasant neighbourhood and broader community on options for new zones to support the innovation economy on industrial lands in the area. Demolish the heritage school to redevelop. Retain the heritage school, move it to the corner and rotate it to face Quebec Street, and add a new 125 feet tall building on the site. Retain the heritage school, move it to the corner and rotate it to face Quebec Street, and add a new 160 feet tall building on the site. None of these options are consistent with the National Standards and Guidelines for the Conservation of Historic Places in Canada, which emphasize that redevelopment should retain the location and context of a heritage site, including that infill be “compatible but distinguishable”. The options being considered would result in the school being demolished, losing its setting through being rotated, or dwarfed in relation to the size, scale and close proximity of the new building. Why is Simon Fraser Elementary School Annex significant? 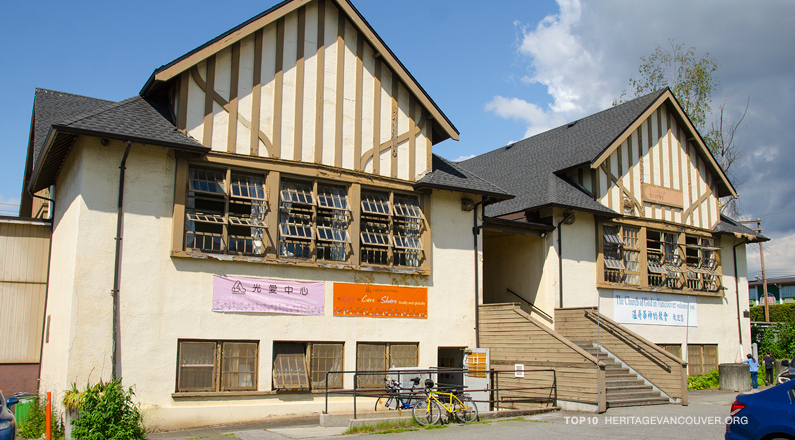 Vancouver Heritage Commission has assessed the heritage value of Simon Fraser Annex, and, in 2016, recommended to Council that this historic place be added to the Vancouver Heritage Register as a Category “B” heritage resource. Simon Fraser School Annex is important as a tangible memory of community life in Mount Pleasant. Dating to 1929, the building is associated with the interwar development and residential growth of this neighbourhood. It was during this period that the Vancouver School Board was amalgamated with the former School Boards for Point Grey and South Vancouver. 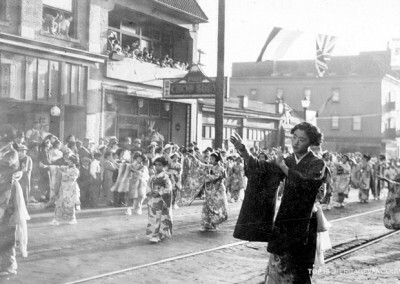 Despite the difficult economic conditions leading into the Great Depression, the Vancouver School Board expanded, and built new facilities to meet the growing school-age population. The School Annex building has architectural merit as an intact example of institutional Arts & Craft-style architecture, as expressed in a two-storey form with paired gabled dormers and its quintessential half-timbering detailing on stucco and wood frame. 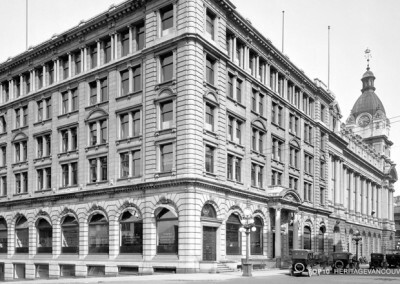 The building has retained a large extent of original elements, such as single, paired and tripartite wooden sash windows, and wooden door assemblies, including the front entrance and its multi-paned sidelights. 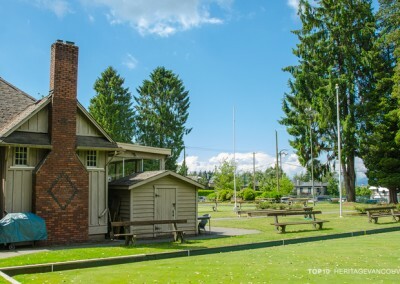 The design of the annex is attributed to Henry Walter Postle, who was the staff architect with the Vancouver School Board for over a decade beginning in 1928. 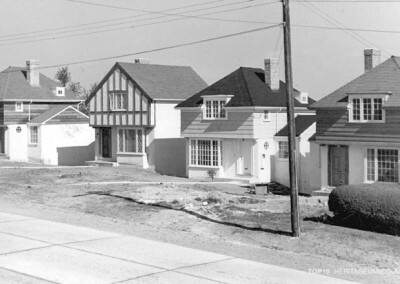 Postle left a notable imprint on our neighbourhoods through diverse projects, ranging in size from “The Barn”, a 1929 Arts & Craft-style building at John Oliver High School (530 East 41st Avenue), to the 1939 Queen Elizabeth Elementary School (1938, 4102 West 41st Avenue), inspired by a visit to Great Britain by Superintendent H.N. MacCorkindale, and based on the ‘cottage’ type of school; this was a radical departure from previous, more institutional-appearing school structures. Any further construction of new schools was halted by the outbreak of the Second World War. Heritage Vancouver Society supports the retention and upgrading of Simon Fraser Elementary School Annex, which could be achieved through community amenity contributions (CACs) from other sites in the light-industrial zones of Mount Pleasant and compatible infill on the Annex site. We support the policy direction and recent changes to zoning to intensify the innovation economy in Mount Pleasant, because they build upon the industrial heritage value of the neighbourhood and bring new vitality into a historic district. At the same time, Simon Fraser Elementary School Annex should be treated as a special site. 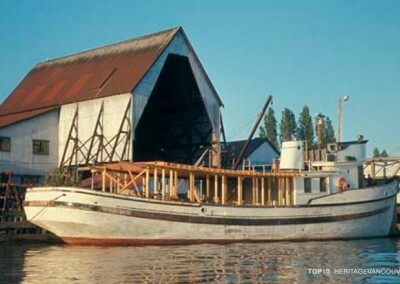 We urge the City to add this property to the Vancouver Heritage Register, and to retain the building rather than demolish. With careful site planning the Annex could remain where it is now, and be co-located with a new building of modestly less height (e.g. 110 feet) than the I-1A and 1-1B zones allow through a design that fits the existing scale of the Annex. Loss of some job space, and upgrades to the school, could be offset with CACs from the development of other properties in the vicinity, and through CACs it may even be possible to use a portion of the school site as urban open space. 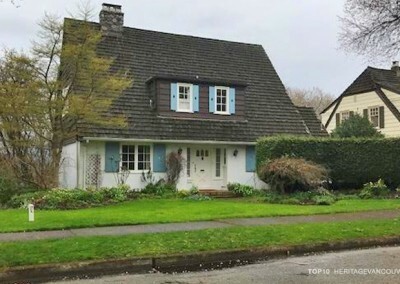 Write a letter to Mayor and Council suggesting that Simon Fraser Elementary School Annex should be added to the Vancouver Heritage Register, and that any new building on the school site should be designed to fit with the existing scale.